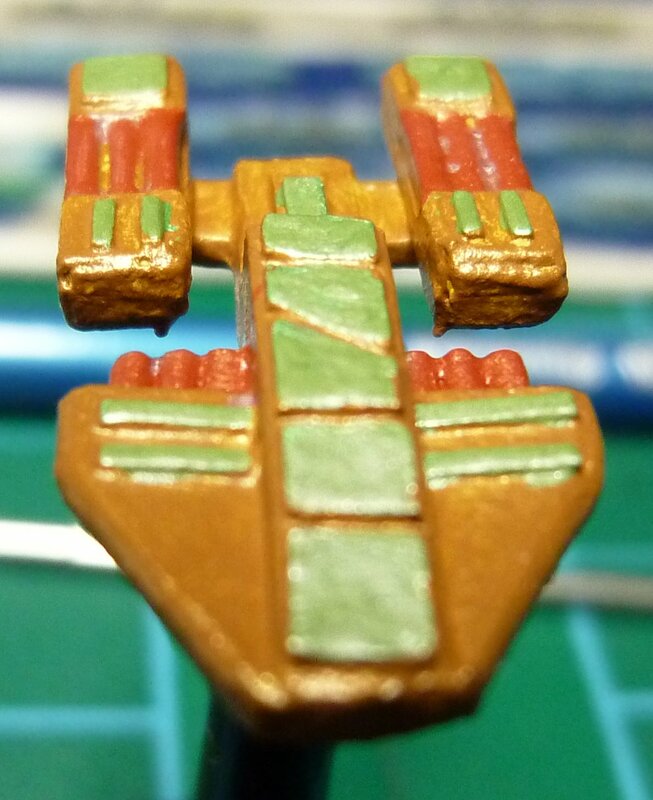 I finally got around to painting a prototype vessel of the PacFed Space Fleet. The models come from Brigade Models in the UK and are, I must admit, really neat. Unlike the Future War Commander PacFed that I painted earlier this year I wanted these to look a little more “spacey”. I therefore thought I’d go for a metallic look. Below are the painting steps I took. The first step was undercoating. In this case I hand undercoated using Citadel Foundation Colours Skull White. As my plan is to paint light colours I find the white undercoat with colour washes works best. 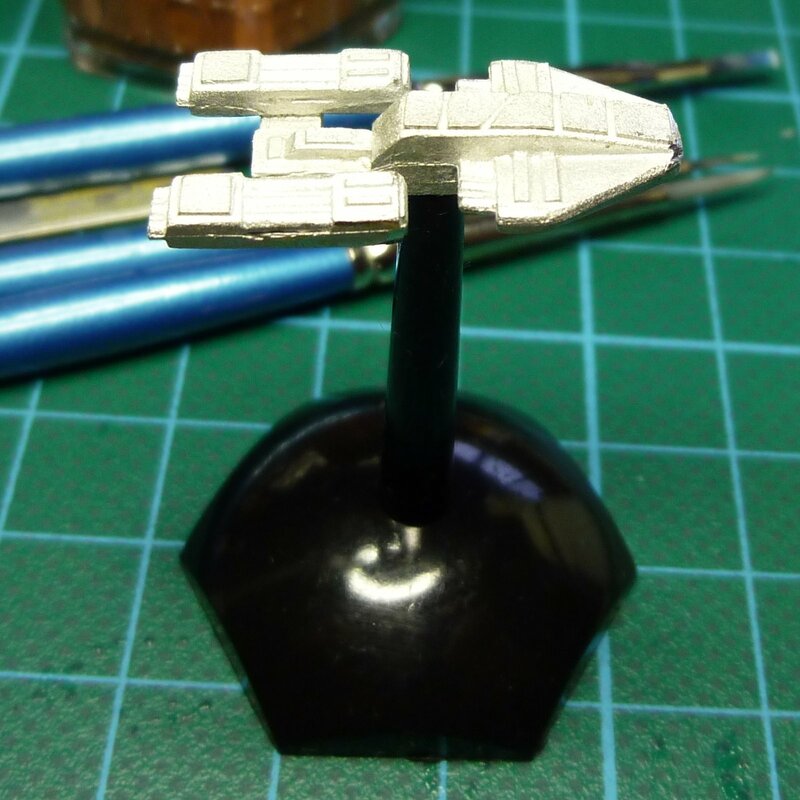 When I paint the full force (there is about 30 or 40 vessels altogether in the fleet) I’ll spray undercoat all the vessels at one time. The spaceship was then covered in a basecoat of Ivanden Darksun. This foundation colour is very useful, especially when painting yellows and similar light colours. The original PacFed forces were all covered in this basecoat as well. After this basecoat, and following the suggestion of the guys at the Games Workshop Bunker in Clarence Street in Sydney, I mixed some colours. The first mix was 2 parts Shining Gold to 1 part Calthan Brown. This was then applied to the model. The next colour mix was 1 part Mithril Silver to 1 part Knarloc Green. The third mix was 1 part Dwarf Bronze to 1 part Mechrite Red. The image to the left shows the paint scheme to this point. The next steps were to mix a wash. The wash was 1 part Devlan Mud to 1 part Badab Black. The model was then washed in that. The next colour was then added. This was Burnished Gold. It was applied over the gold areas. A final wash of Sepia Gryphonne was then applied to the whole mode and the black stand was touched up to take care of paint splashes. I’m not 100% satisfied with this yet – I think I want the piping more red and the green could be, well, maybe greener but overall the gold is growing on me.